Who says pistols aren’t accurate? I used to shoot pistols. I was very good…but then again I put literally thousands of rounds down range and shot almost every Saturday and Sunday. I shot so much that I’d spend the rest of the week reloading. One comment I always got when someone asked about pistol shooting was that they believed that pistols weren’t very accurate. My response was that pistols are in fact very accurate, it is the shooter who isn’t accurate. I could put 6 rounds from my S&W model 10 into the target so that an old 50 cent piece could cover the holes…at 50m. I could do this because I’d shoot thousands of rounds at that range and I knew my load, my gun and the range intimately. The professionals shoot even more and as a consequence can perform feats like this…A Glock .45ACP hitting a steel target at 215 years! But then again this is Jerry Miculek…one of the greatest pistol shooters alive. Beautiful video of a mast at work training people how to shoot properly with a pistol. I used these techniques when I was pistol shooting in my early twenties. Anyone who says pistols aren’t accurate is mis-informed and/or has no practical experience shooting lots of rounds down range with a pistol. Sure they are the hardest of firearms to master for accurate shooting but in the hands of trained professionals they are very accurate pieces of equipment and a nice handy size to boot. 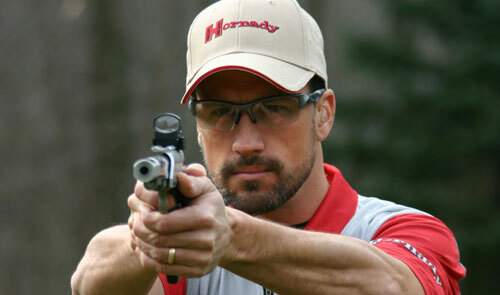 These techniques as shown by Todd Jarrett in the video are all still used by the top shooters in the world, the likes of Rob Leatham, Jerry Miculek, Doug Koenig, and Eric Grauffel. All of those guys are a pleasure to behold as they shoot. The poise, balance and accuracy that comes from thousands and thousands of rounds of practice.